We’re looking for suggestions for social media measurement experts to invite to speak at Third Tuesday Social Media Measurement Matters #TTMM conference. 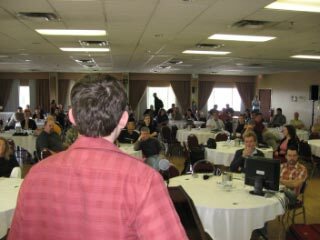 Already, a number of speakers were suggested or volunteered in response to the initial announcement of the conference, including: Alan Chumley, Rob Clark, Jen Evans, Leona Hobbs, Jay Goldman, Brian Cugelman, Olivier Blanchard, Alex Brasil, Josh Hallett, Darren Barefoot, Claude Theoret, Paul Cowan, and Chris Berry. It’s also been suggested that we invite someone from Gatorade. You’ll remember that they made quite a splash last month with their new social media mission control centre. I’m sure that they could offer insight and learnings from their experience with this. The good people at Sysomos, MediaMiser and CNW Group/DNA13 also have offering to contribute their expertise. We’ve all been to conferences where speakers’ presentations duplicate one another. Conferences where panelists presentations take up most of the time and leave little time for interaction and audience participation. We want to avoid these problems by structuring the panels to maximize the time for questions and answers and interaction between panelists. After all, why bring together a group of the brightest people around if you don’t want them to interact with one another and the participants at the conference? Each panelist will be asked to speak for ten minutes on a single issue or idea that he or she thinks is of paramount importance and will be asked to clearly state one big or actionable idea that we can all take away. Then, we’ll throw the discussion open to the floor, inviting your questions and comments. In this way, we hope to hear some great ideas and have plenty of time to discuss them and their implications. Our aim is to put together a conference that brings together the speakers that you want to hear from. Who are the experts on social media measurement you follow? Who have you heard give a great presentation on measurement? The doors are open wide to your suggestions and ideas. Please give us your suggestions as a comment on this post.